If you grew up in the NES era, you probably at least heard the name River City Ransom. These days the game is infamous for its sprites and translation. 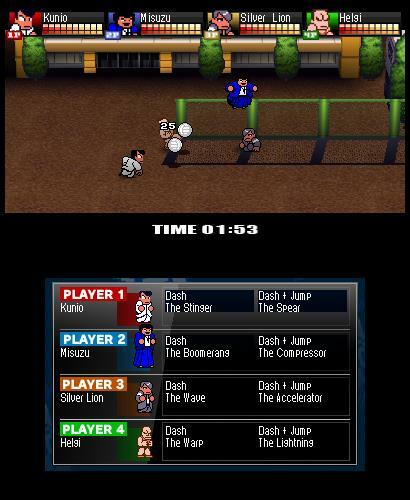 Well River City: Tokyo Rumble is basically a spiritual sequel. The game stars Kunio as he sets out pretty much kick the asses of anyone who dares to get in his way, or mess with his friends. Speaking of Kunio though, I should probably mention a little history regarding him. 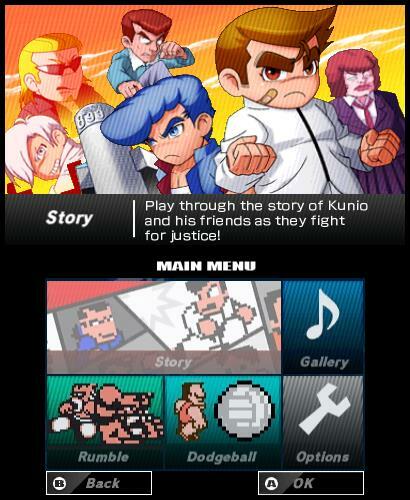 Fight Kunio! Fight for everlasting peace! 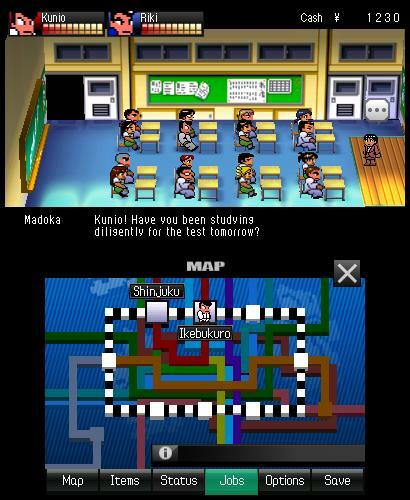 In Japan the franchise is simply referred to as the Kunio-kun series. The games have always stared Kunio and have taken various forms, from Soccer, to Hockey, to even Dodgeball. The series has endured over the years and been known for its over the top nature and fun gameplay. The same extends here. How so? Let’s start with the fact I can beat someone over the head with a bicycle. Yep, this is that type of game, everyone. Where the silly and quirky are king and the result is a lot of laughs and fun. Let’s start talking about the demo itself so I can explain this in context. 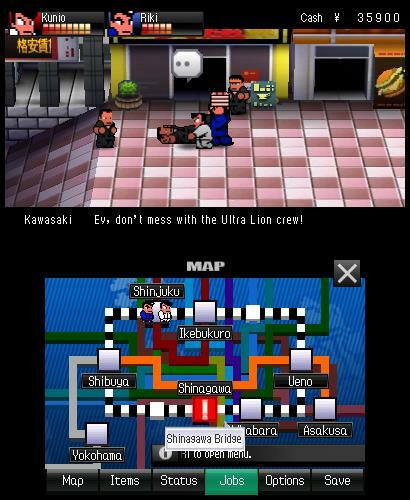 The city has been taken over by gangs and it’s up to Kunio and friends to set things right. The game begins with one of Kunio’s friends getting knocked out. From the looks of it, be prepared for a lot of call backs to that game, but if you’ve never played it, no worries. From there I set out to take down anyone in my way, and there were actually quite a few enemies. My goal was to reach the train station which was about two screens away. And while I never felt like I was being swarmed with enemies, they do take a little bit of time to take down. This is mainly because you improve your character through equipment and skills you can buy at shops. Money is earned from doing jobs and defeating enemies. However, starting the game you are pretty weak. It took quite a few hits to take down a few of these enemies, but there were items around to help speed things along, like the bicycle. Once I got to train station I was faced with my first boss. O-of course! I totally haven’t been wandering around Tokyo beating up thugs, promise! The fight wasn’t hard, but it really underlined just how weak I was. This took a good couple of minutes, but I managed to take the guy down. I think my biggest complaint here would be that the boss didn’t really seem all that challenging. He just had a mountain of HP and I was doing very little damage. As I mentioned, I could farm some money to buy some equipment, but for sake of time I was just trying to move through the demo as quickly as possible to see how far I could get. I wandered around for a little bit after this, but the climax was really this boss fight. I think if I had spent a little more time working to improve my stats, this would have gone quicker. I’ll be curious as to how this plays out in the full version. That said, I still really liked the demo. See, totally haven’t been beating anyone up! I’ve just be playing dodge ball instead… I’m gonna fail that test aren’t I? I think a big reason for me liking this is the nostalgic throwback, but also the localization. It is very much a throwback to what I must imagine River City Ransom was like. Sadly, I never did play the NES classic, but I can see its influence. One thing I will point out is that this game does look visually very good. Everything looks vivid and pops on the screen. It’s a very colorful world and one I doubt I’d get bored traversing. If you played River City Ransom I think this is a no-brainer. If you’re new to the franchise though, I think it’s a good pick if you like beat’em ups. A genre which sadly gets very little traction these days. Bottom line, I think it’s an interesting little title and I’m hoping this isn’t the last time we see Kunio in action.